Besides causing huge losses to the state exchequer, illegal mining is impacting the ecology of the region drastically. In most of the mining areas, the Ganga’s river bed has become hollow. In the wake of the death of Swami Nigmanand due to fast unto death demanding ban on quarrying on the Ganga river bed in Haridwar, the focus has now shifted to illegal mining in the region on a mass scale due to administrative laxity. 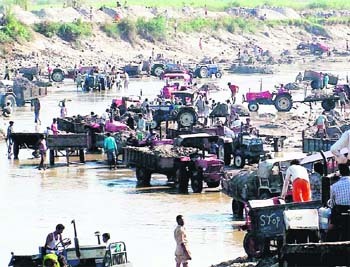 Though quarrying has been banned in Kumbh Mela area zone, which covers 140 sq km area in Haridwar, legal mining is allowed to take out silt deposits and minerals from the river bed. Illegal mining business has overtaken the legal business aggregating losses to the state in hundreds of crores of rupees annually. Quarrying on a mass scale worth billions of rupees is being done in Haridwar district. What is more surprising is that it is continuing under the very nose of the district administration. It has a drastic impact on the ecology of the region as in most of the mining areas the river bed has become hollow, changing the course of the river. Besides, the agricultural land due to cutting of riverside land for mining purpose is shrinking. This poses problems for the villagers, a majority of whom are dependent on farming for their livelihood. As per information received by The Tribune, due to legalised quarrying, the state government exchequer gets annually Rs 10-12 crore as revenue, which is maximum in comparison to the revenue earned by other districts of the state. Due to illegal mining, quarrying is a trade worth about Rs 200-300 crores as per the estimates of the people involved in this trade, administrative sources and the beneficiaries from the illegal trade. Gyan Aggarwal, owner of Himalayan Stone Crusher involved in quarrying in Jagjeetpur, Ajeetpur region, against which primarily Nigmanand was agitating, denies any illegal activity from their side. He said that as per the Nainital High Court stay order work was going on with the permission of the district administration. So, no one should point a finger on their quarrying operations. He has the permit and anyone can inspect whether the quarrying is being done beyond the permitted area. Refuting the claims of Matra Sadan saints, District Magistrate Haridwar R Meenakshi Sundaram told TNS that as the Nainital High Court had ordered a stay on the Uttarakhand government notification on banning quarrying in the Maha Kumbh Mela zone since May 27 last year, it would be a contempt of court had action as taken against the mining being done in the mela area that includes the nearby region of Matra Sadan ashram too. “The ongoing mining is as legal as court’s order. As per my knowledge there is no illegal quarrying going on. Still an administrative probe is being conducted to check if any such illegal trade is going on. If found, strict legal action will be taken against the culprits” said Sundaram. While Matra Sadan ashram has long been raising this issue against illegal quarrying on the Ganga river bed local, people too have formed a samiti to bring to notice such illegal work. A social organisation named “Dagadiya Jan Kalyan Samiti” in Laldhang block has been involving local villagers to oppose the illegal quarrying affecting the Ganga embankments. Yielding to pressure, the Uttarakhand Government today ordered a CBI inquiry into the death of Swami Nigamanand, who had been on fast for about four months protesting illegal quarrying and mining in the state, amid allegations that he was poisoned. “Chief Minister Ramesh Pokhriyal Nishank has decided to hand over the inquiry related to the death of Nigamanand to the CBI,” said Devendra Bhasin, the media adviser to the state government. Nigamanand, who died in a hospital here on June 13, was on fast since February 19 demanding immediate halt to illegal quarrying in the Ganga and shifting of Himalaya stone crusher from the Kumbh area.